Commercial food facilities often have areas where high dust is present, which can create a scenario where equipment must be used that can be safe in these various environments. While many people may not think of a commercial food facility as an extreme environment, when electrical equipment combines with fine dust particles, which are commonplace in bakeries and commercial food facilities, serious damage can occur if any material becomes a source of ignition. For this reason, it’s incredibly important that scale owners carefully choose their scales for environments where dust and other fine food particles are present. Arlyn’s Guard B line of bench scales are designed for applications where a capacity of 5-150 pounds is present and a resolution of between .001 and .05 pounds is sufficient. Our Guard C cylinder scales are ideal to weigh drums or cylinders that may house hazardous materials. Guard C scales have capacities of between 60-400 pounds and a resolution of between .02 and .1 pounds. 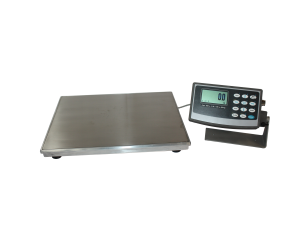 For customers needing even larger capacities, our Guard P platform scales feature resolutions of either .1 or .2 pounds and a capacity range of between 500-1000 pounds. Finally, if you’re looking for a scale with a much higher capacity limit than our Guard P scales, our Guard F floor scales have a capacity range of between 2500-25000 pounds, and a resolution of between .5 – 5 pounds. Aside from our intrinsically safe scales that are ideal for even the most challenging commercial food environments, our scales also are packed with features that will make your life much easier when weighing a variety of materials. Below are just a few of the features that should not be overlooked when choosing a scale for the commercial food industry. In any business, weight is incredibly important. When it comes to a business in the food industry, whether you’re formulating large batches of food for a restaurant, or ensuring that your supplier isn’t shortchanging you in terms of raw materials, scales help businesses keep a keen eye on their bottom lines. USB – Simply run a USB cable between your computer and scale, and instantly be able to import weight data into a variety of different applications. Once connected via USB you’ll be able to control and monitor your scale’s performance right from your computer. Using our USB Remote Software, you’ll be able to export data into a CSV format that can be easily viewable in either MS Excel or MS Access. Data logging – One of our most welcomed features was the addition of our data logging capabilities. With data logging you can plug in a standard USB flash drive directly into your scale to download weight data. This is ideal for situations where connecting a scale to a computer isn’t feasible. Ethernet & Wi-Fi – An exciting development in the world of industrial scales is remote operation. At Arlyn Scales, we offer Wi-Fi and Ethernet connectivity as an option on many of our scales. Combined with our Remote Indicator Software, users can easily control their scales remotely over an Ethernet or Wi-Fi network. This allows scale owners to operate their scales from anywhere in the world–provided that they have an internet connection. Troubleshooting can now happen from anywhere, without having to be physically at your facility. Over the past few years, one of Arlyn Scales’ major focuses has been on completely redesigning the digital indicator, which has been a fixture on scales of all types for decades. Recently, Arlyn Scales has unveiled the Arlyn Scale Touschscreen Indicator, which is a fully functional 7-inch IPS tablet device that is powered by the widely versatile Android operating system. Coupled with a quad core processor and 8GB of onboard storage, as well as 1GB of RAM, this touchscreen display offers our customers a much more user friendly and feature packed way to access and control their scales. One of the best features of our scales doesn’t have to deal directly with how they’re made, but rather how our business is structured to benefit our customers. At Arlyn Scales, we’re headquartered in Long Island, New York, where we design and manufacture all of our scales and subassemblies. Unlike many of our competitors who manufacture the majority of their scales overseas, we’re committed to designing and building all of our scales here in the US. One of the biggest benefits of a US based design and manufacturing facility is that we’re also able to offer our scales factory direct to our customers. This helps us to eliminate any costly distributor markups and pass these savings along directly to our customers. Our customers enjoy a higher quality scale, at a price that is still in line with many of our competitors. If you’re still unsure of the best scale for your commercial food facility, don’t hesitate to contact the team at Arlyn Scales today. With more than 30 years of experience in the scale industry, we’re confident that we can provide with the knowledge that you need to succeed in today’s highly competitive marketplace. Give us a call today at 800-645-4301 to hear more about our wide array of industrial scales that are well suited for the commercial food industry.